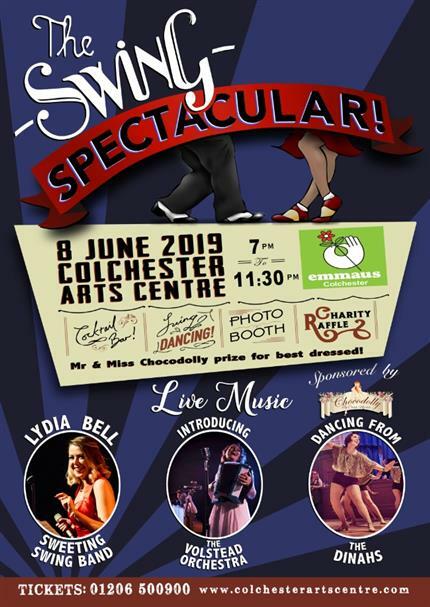 The Swing Spectacular returns to Colchester Arts Centre for its 4th year of unmissable swing entertainment celebrating music and dance from the ‘20s to the ‘50s! After three consecutive sell-out nights in 2016-2018, Vocalist and vintage extraordinaire Lydia Bell is back to stoke the fires of the #swingrevolution. With THREE live bands, swing dance lessons and performances, a speakeasy-style cocktail bar, and the first ever Most Spectacular Vintage Dress competition with exciting prizes to be won! FULL LINEUP TBA! If your dancing shoes don't quite fit any more or you'd rather just socialise and listen to some great music, never fear, there is seating available, along with other exciting entertainment for you to enjoy! However, you are advised to arrive early to ensure you get a seat. 'Swing-era' dress is warmly encouraged! Doors open at the earlier time of 7.00pm, get there promptly to learn a dance move or two!